At 11.30am today Ian (stroking in the picture) recorded the 31st pod cast: http://embed.ipadio.com/embed/v1/embed-352×200.swf?callInView=100391&channelInView=&phlogId=41329&phonecastId=125335. Amazing news he shared: The winds have picked up, the speed with it and although there are confused swells Barbados is coming closer and closer. As a result, banter is back on full throttle and morale picked up massively. If it stays like this they hopefully arrive in Port St Charles, Barbados, in seven days from now. Ian said that night shifts were as interesting as day shifts and that by now he’s covered about anything he can talk about with Mark, who’s rowing in the seat behind him. I’ve also received an email from Aodhán, which shows that the batteries are recharging again and the guys are able to use the laptop again. He wrote: “As I type this we are officially on the home stretch in my mind the winds have picked up and we should have them the rest of the way. Still a chance of getting the record by a few hours but as usual we rely on the weather for that to happen. Don’t worry – all is good here. Fun fact – the Dutch ocean rowing documentary we watched – that boat Vopak Victory is our sister ship and is exactly the same design – designed by a Dutch yacht designer – bloody Dutch ;-)”. 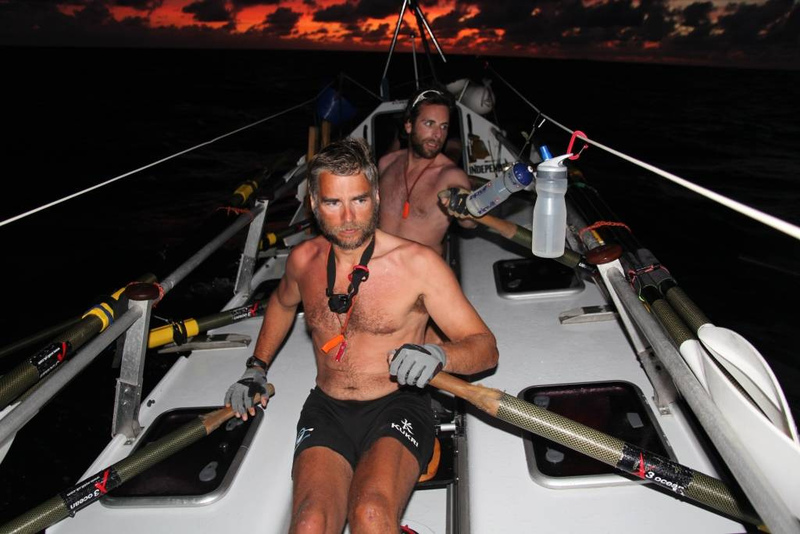 The last week was the toughest week the skipper Matt has experienced out of all the ocean rowing he’s done. He wrote the following: “With the calm of the Atlantic Sara G has not only had her toughest week of the expedition, but her toughest week under my watch. The crew posted as little as sixty nautical miles some days with a mixed bag of no wind and swells from every direction. Despite all of this the crew have battled on to make this small total. It has now made our world record attempt a massive challenge. Morale is high and we hope for good weather soon, but it seems everything is against us at the moment! The latest technical difficulty has been the loss of our electrical power due to the lack of winds and no sun for the past few days, this has meant we are now navigating the old fashion way like the old mariners used to. We hope to have better news soon and would like to thank everyone for all the messages of support we have received, on days like this they mean everything to us. We will continue to give it our all till we reach Barbados and hope to see a change of fortune in the coming ten days”. For all of you followers in Reading, check out the Get Reading newspaper you received in the post on Friday. There is a great spread on page 5 featuring Aodhán’s row and his fundraising efforts. For all of you still keen on supporting Plan’s Girl Fund (“Because I’m a Girl” campaign) please click HERE to donate. Any small amount helps!